Explore and experience the most beautiful sites of the Yucatan Peninsula and the Riviera Maya in only 7 days! This tour contains historical, challenging and funny activities. This eco tour will give you an authentic tourism experience and more knowledge of Mexico. Discover the history and wildlife, snorkel in a cenote and swim with a Whale Shark! Escape from your daily life and go on this unforgettable tour with, nature, adventure and culture! Arrival at Cancun airport. Transfer to your hotel. Overnight in Arrecifes hotel or similar. ATV-driving or snorkeling in a cenote. Excursion to the Sian Ka’an Biosphere Reserve. Kayak through the wetlands, hike through the jungle and snorkel in a cenote. Overnight in Arrecifes hotel or similar. Visit Chichen Itza, archeological site, one of the new seven world wonders. Learn about the Mayan culture and traditions an also visit cenote Ik Kil. Summer season (mid-May til mid-September): Swim with the Whale Sharks! 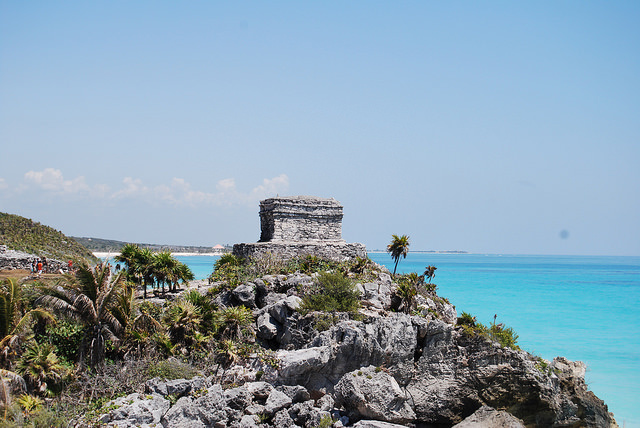 Winter season (mid-September til mid-May): Visit the archaeological sites of Tulum and Coba!